Selling to the rapidly expanding market in China is a great opportunity for most global businesses. While many business owners may be very excited by the market potential in China, it’s very difficult for them to start with the strategy and establish distribution channels in the Chinese market. Sinostep had helped a variety of international companies develop and manage their China distribution networks in China with China market entry and business development services. we have gained valuable experiences in the process for overseas business entering the Chinese market. Imported Food: Chocolate, Ham, Pecans, Olive Oils, etc. Nuts: Pecans, Pistachios, Macadamias, Cashews, Walnuts, Pine nuts. Wine: Red wine, Liquor, Whiskey, Beer, etc. Fashion: Women Apparels, Bags, etc. Baby Products: Baby shoes, Infant formula milk powder, etc. 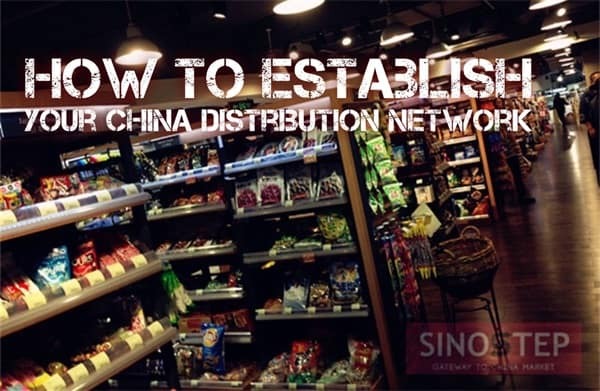 Below we offer a guide on the steps needed to effectively develop and manage distribution for your products in China. Your first step is to conduct an initial research and find out the potential demand for your product to see whether it’s feasible for your business to enter into the China market. Choose your prioritized market suitable for your products, check China city tiers for your reference. Find our who are your target customers and study their consumption behaviours. You should understand there are quite a lot of differences among different local customer types. Unlike the central planning for many products many years before, today, foreign enterprises may participate in distribution for most products in China. However, there are still some industries which are not fully open to foreign companies in China. It’s important to find out whether foreign companies are permitted to operate in your industry in China. Also you should collect information about relevant policies to understand what required certifications are necessary and what legal procedures you should practice before your products can be sold in China. You will need these in details to understand how it works legally and how long it will take for each step. You will need to find local partners after you have basic understanding of the China market. Hire some professional consultants or get connections from your business or personal network to find the key players and potential distributors in your industry in China. You will need to start studying them and contact them. Actually you need to develop your marketing strategy when you start working on the study on the major players and distributors in the market. Prepare your company profile, website, business presentation, Email pitch before you approach the industry leading players you have identified. Talking to these potential key players will help you quickly and effectively understand the true market situation. Before you can do this, you should have your rough China plan first, and possible cooperation benefits that could bring your counterparts to the table. Sit together with you China partners and develop your local marketing strategy in China. Sometimes, you will need Chinese translated files to facilitate your negotiation process with local contacts. We strongly recommend you to hire a reputable local China business consultant (not a lawyer) to help you with the meetings with the targets and it will help you avoid many mistakes. Now it’s time to have your own local team, it can be through the recruitment of your own staff or the cooperation of some key players you have approached earlier. Prepare Marketing tools: website, company brochures etc. It will be important to have your own local team which can guide you through China’s unique business culture in the following operations to handle various tasks. Since normal company set up will take a relatively long time, you will need to find some transition ways to solve the possible problems and continue your preparation work before the formal operation in China. For Branding and marketing tools, make sure you hire someone who understand China culture to do this job since it’s quite different between the East and the West. Now you have most of the basic resources you need to start. Your sales team will be necessary to visit potential distributors in person. You will need to support them to attend trade shows, industrial gatherings etc. Make some criteria and adjust them if necessary to make sure the distributors are qualified. Encourage your sales team visit the potential distributors on site to see their physical real operations to understand their capability, strengths and weaknesses, and learn their business model. You will need various resources to double check the reliability and reputation of the company. As long as you identified good distributors you can enter into the next stage and welcome initial results of sales. However, you will face a lot of unexpected problems you might never imagine. Be sure to keep an eye on your competitors and consult your local business network to solve them. Understand the Chinese culture and understand your distributors. Provide them sufficient support and encourage them to get things started. You will need to grow and maintain your sales and distribution network in a healthy way. Keep your own team communicate regularly with the distributors, provide sufficient technical and marketing support, solve product problems and ensure the logistics.